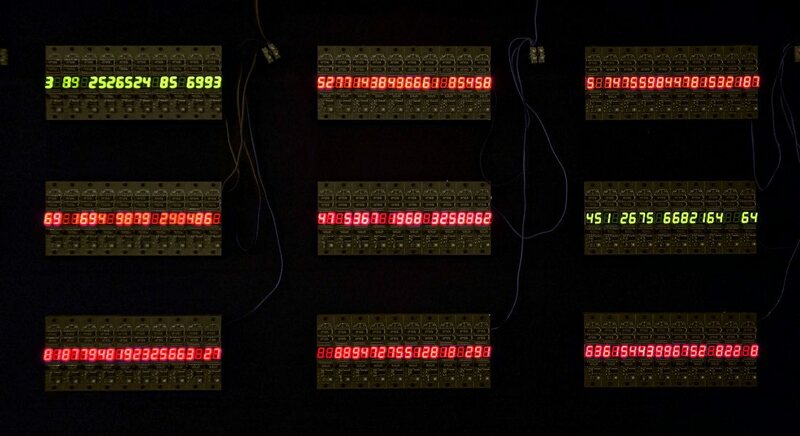 Since 1987 Tatsuo Miyajima has been working with kinetic sculptures in an attempt to understand and represent the experience of time. The earliest of these pieces used found elements of electrical gadgetry but he very quickly settled on the use of LED counters. From these relatively simple elements mounted on walls, on the floor, under water and even on model dodgem cars, he has created a vast diversity of configurations. ‘Region no 126701–127000’ consists of 300 LED panels which seem to be counting endless sequences between one and 99. Unlike most kinetic works, it never repeats the same moment. It quite literally exists in a state of constant change but has no cycle of repetition. In this sense it is like a living organism. The numbers may also be seen as a representation of events in the world, such as the decay of atomic structures, the formation of nucleotides and the universe as it continues to expand. The installation is a composition of units of red and green counters, the kind that appear everywhere in our daily lives: in signage, watches, calculators and scoreboards. In Miyajima’s work individual units count from one to nine, each with its own rhythm. Miyajima has provided a stamped certificate with each panel, outlining the sequence and rhythm should it ever have to be reset. He has said that each pair of numbers could be thought of as a human being, the units as families and the large groups as tribes or nations. The various timescales suggested can be seen as metaphors for everything that exists. Miyajima’s Buddhist beliefs are reflected in the work through the repetition of the numbers one to 99, signifying a revolving cycle of time, death and rebirth as part of a continuing movement. Zero, which indicates an end, never appears. The 300 elements are arranged in banks of 10 with adjacent banks linked. Every seventh counter is green. This colour sequence further complicates the computational possibilities of the work. The number of connections in each counter is mathematically counted and is very high indeed: the possibilities for 300 counters connected in different ways is astronomical, hence the reasonable assertion that the piece will never repeat itself. Inspired by his spiritual leader Daisaku Ikeda, Miyajima seeks to express, or ‘push out’ into the world, his ideas of a new humanism based on Buddhism. He feels that ordinary people may have become alienated from art and wishes to bring art back for the people. Miyajima believes art can help humanity overcome the difficulties of the late 20th and 21st centuries. Signed centre certificate of authenticity nos.126701 - 127000, black fibre-tipped pen "Tatsuo Miyajima". Not dated. Tony Bond, TAASA Review , "In the Public Domain", Sydney, Sep 1998, 12 (colour illus.). Bruce James, Art Gallery of New South Wales handbook , 'Asian Collection: East Asia', pg. 246-287, Sydney, 1999, 287 (colour illus.0. Natalie King, Art and Australia (Vol. 43, No. 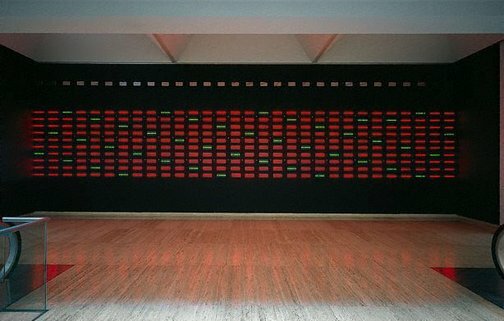 3) , "Tatsuo Miyajima", Sydney, Mar 2006-May 2006, 436. John Saxby, Look , 'Lindy Lee. The art that made me.' inteview, pg. 12-13, Sydney, Aug 2015, 12 (colour illus. ).